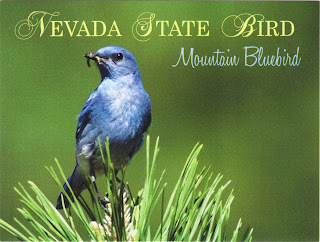 Postcard US-2399736 to Germany shows a Mountain Bluebird, which is the Nevada State Bird. Nevada Day commemorates the admission of the state of Nevada into the Union on October 31, 1864. In 1933 the Nevada state legislature designated October 31 as Nevada Day and a state holiday. Since 2000, it is observed on the last Friday in October. Therefore, we are celebrating the 149th anniversary of the Statehood over a three-day weekend starting October 15, 2013. In Carson City, the capitol of the state, there will be an annual Nevada Day Parade from 10am to 1pm on October 16, 2013. In 2014, Nevada Day will fall on October 31, the actual day of admission to the Union.